Education systems around the world are calling for the use of Information and Communication Technology (ICT) to enhance education and drive it further and faster into the 21st century. ICT is considered by many to be a great equalizer for quality education around the globe and view it as the best way to prepare children with the skills they will need to succeed in work and life. The question remains, however, how do we reach the millions of students in the developing world for whom ICT is not easily accessible? Does the lack of computers and other digital technologies in their classrooms mean students are destined for poor quality education and for meager life prospects because they do not have chances to develop ICT-related skills? We have recently participated in an experience that suggests the answer is “no,” quality education is not bound to the use of technology in the classroom. The teaching and learning of other 21st-century skills—such as creativity, critical thinking, and collaboration—can help students succeed in any context and does not require technology. Furthermore, acquiring these skills can equip students better for ICT when they do finally get access to these. The Speed School program Geneva Global is running on behalf of clients is one example of this. Speed School is a non-formal education model which brings out-of-school children aged 9 to 14 back into formal school, or enrolls them for the first time. The program operates presently in Ethiopia, Uganda, and Liberia to provide students with the critical education they need, along with a focus on transferrable 21st century skills. “In general, Speed School teaching methods contribute significantly to the development of students’ confidence, questioning skills, and self-expression,” explains Ms. Takelech Abebie, a Geneva Global Speed School advisor in Ethiopia. Speed School students strive to get things done efficiently, effectively, and with fun. Their classroom “facilitators”—teachers—engage them in a wide range of activity-based learning, including through games, practical tasks, drama, music, art, and more. Two groups of Speed School students, one each in Ethiopia and Uganda, recently showed that the highly competencies-focused education they receive has equipped them with the cognitive tools and confidence they will need when they find themselves with the opportunity to access ICT. 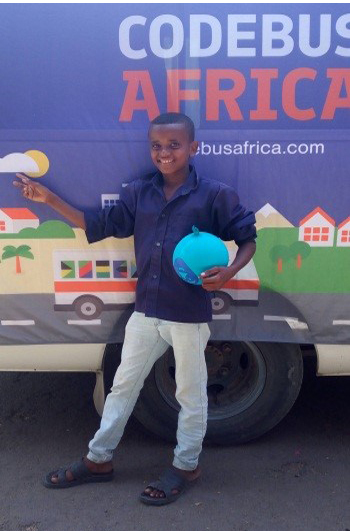 In this case, it was their involvement in the CodeBus Africa project. 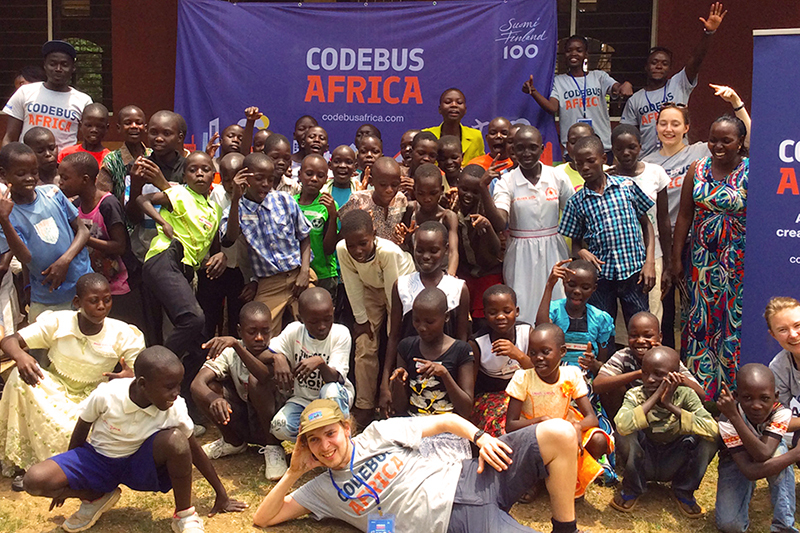 CodeBus Africa, led by Aalto University, Finland, was organized collectively by African and Finnish innovators in technology and education to bring interactive coding workshops to young students in 10 African countries. The project aimed to inspire youth to discover and explore technology’s possibilities for their futures. It was precisely because of their experience with hands-on, practical learning that our Geneva Global colleagues in the two countries felt CodeBus would be a successful, stimulating experience for the students. The CodeBus project gave students an opportunity to apply their acquired skills and talents to computers, which many students were seeing for the first time. They excitedly collaborated to create original songs with the open-source software Sonic Pi and were especially enthusiastic about learning to code. The Sonic Pi software allows students to create patterns of sounds using programming concepts and aims to highlight each student’s creativity through her or his own musical creations. Students also learn about sequencing and algorithms, which can be applied to various aspects of their personal and academic lives. This was an opportunity to discover how activities-based pedagogy and technology can complement one another. The students applied the critical thinking and creativity they developed during their daily lessons to the concrete task of using computers to code. They have become confident and engaged learners in both independent and collaborative settings. They have quickly acquired core skills in reading, language, and mathematics, permitting them to follow lessons and instructions effectively. Their learning happens with a clear sense of purpose, making them able to recognize the ways in which their learning can be contextually relevant in both their classrooms and personal lives. In the days following the training in Ethiopia, Takelech shared that students continued to buzz with excitement from what they learned. Many expressed the desire to share their newly-gained knowledge with classmates, friends, and family members. The CodeBus experience clearly engaged the intellect, spirit, and creativity of the students and stimulated the ambition of all who participated. It also served to validate that quality education and 21st-century skills are well within the reach of students for whom still ICT remains largely inaccessible. "...our work with academic partners further strengthens the impact..."